At this past National Grange Session our National President, Betsy Huber, presented her Masters Address. She highlighted the National Grange’s past accomplishments and presented the top priorities for the coming year. One is the Farm Bill. There was hopes that this bill would be finished by now but progress has stalled. The Senate and House Agricultural Committees have been working hard compromising between the House and Senate bills but it has not been brought to a vote. We can hope that the lame duck session can pass it before the end of the year. Another initiative that the Grange is venturing into is the definition of milk. The USDA has defined ‘milk’ but they have not been enforcing it. The definition of milk was one of our resolutions in the 2016 session that we passed on to National Grange. This also made us think of another area that may need defining. How are they going to define laboratory created meat? In the dairy area the National Grange is fighting for better dairy prices for farmers. This is especially important in the Northeast area as our dairy farms cannot produce milk at the same costs as the larger dairy farms in the Midwest. Healthcare and Medicare is another topic that the National Grange is closely watching. They are concerned about drug pricing, availability of medical services, affordable medical insurance and the closing of rural hospitals. In Connecticut there have been two hospitals that I am aware of that were bought up by a larger medical corporation and the local hospital services have been reduced greatly. 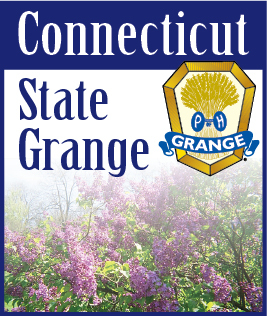 Connecticut did pass on a resolution to the National Grange addressing a discovered loophole where Medicare was declining convalescent home care for Medicare patients as they were never “admitted’ to the hospitals. Hospitals have been putting these patients in “observation status” which does not meet the requirements for covered continued care after leaving the hospital. This resolution was passed at National Grange with minor revisions. The National Grange is also monitoring immigration reform. They want to make sure that there are adequate agricultural workers available for the farming community. One recommendation is the reduction of paperwork that the farmers have to prepare to permit them to use immigrant workers. The most important thing that we as Grangers can do is become more involved with our local communities and in local issues.